This lightweight and practical, four component dynamometer measures the cutting forces in any drilling process. The measured values can be read on the internal display or on a large external display using auto-hold. The PC-based data acquisition is performed over the built-in USB interface with the included software for tool dynamometers. Over the same interface the device parameter setup for wear detection is executed. 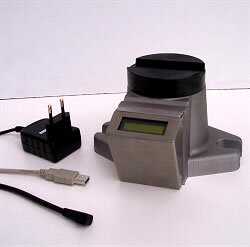 After the setup, the device is able to supervise a drilling process without a connected PC. With this great properties the device suits multiple educational and industrial applications.